In the heart of the Baltic Sea lies Sweden’s largest and sunniest island, Gotland. It's a natural exhibition of fascinating medieval infrastructures, boasting ancient churches and walled ruins laced across the grassland. 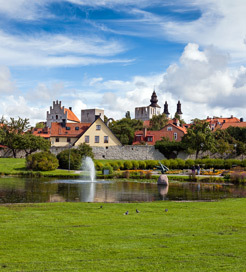 The main town and port, Visby, is a Unesco World Heritage Site that oozes charm. The sea of quaint cottages surrounded by a 13th Century fortress wall is so extraordinary, it feels as though you’ve walked into to the middle ages. Gotland’s medieval chapel ruins are some of the most impressive in the world. The standout structure, St Karins Kyrka, was built in 1233 and displays a magnificent interior and awe-inspiring archways. For a deeper insight into the island's past, organise a tour of the Gotland Museum. It features various exhibits including human skeletons, Viking weapons and the world’s largest booty of preserved silver treasure. You can also learn about how the Black Death devastated the island in the 1700s. A day at Tofta Viking Village offers a more hands-on approach to learning, where you can live like a Viking for a day. You’ll be taught how to bake 8th Century-style bread, shoot arrows and throw axes. Make the most of the island’s 800km of coastline and pristine beaches during the summer months. You may even catch the residents playing curious local sports such as ‘Kubb’, which involves hurling wooden batons at wooden blocks. Why not spend a few leisurely hours searching for fossils along the shoreline? You might even stumble across some hidden Viking treasure. Fossil hunting trips can be booked in Gotlandssmychken, a shop in Visby. There are two ferry routes connecting Visby and the Swedish mainland. 60km south of Stockholm, on Route 73, is the port of Nynashamn. Here you can choose from three high-speed sailings every day. There’s also a ferry terminal in Oskarshamn, southern Sweden, which provides slightly less frequent sailings. For more information, please visit our Ferries from Sweden to Gotland page.